Hearing aids are not as scary as you might have been led to believe. For some, the idea of a hearing aid device causes anxiety. Unfortunately, there is a lot of misinformation out there and stigma involving hearing aids. If you’ve heard horror stories about hearing aids that never really worked, it’s worth investigating what you can actually expect from these devices. Here are a few of the most common hearing aid myths. A hearing aid is a big decision that I’ll be stuck with – Just like you wouldn’t buying a car without taking it for a spin, patients can use hearing aids at home as part of a trial period. After all, it’s better to try a hearing device in the real world than locked away in an office. Since I only have hearing loss in one ear, I only need one hearing aid – Sounds come from every direction and we normally use both our ears to hear. While one hearing aid in the ear with hearing loss will help, two digital hearing aids will do so much more. The hearing aid in your good ear can pick up sound and carry it wirelessly to your other aid, significantly improving your hearing capability. Follow-ups are just a way to charge me more money – Follow-up visits are scheduled to improve your hearing aids and make sure they are adjusted properly and working to the best of their ability. This is especially important for young children that may not always communicate how well their hearing aid is performing. Like putting on a pair of glasses, hearing aids should work right away – Hearing loss is a bit different than vision loss, and as such it can take more time to get right. Keep in mind that hearing aids are not a cure for hearing loss. They will, however, improve your communication and quality of life significantly if they are properly tuned for their user. 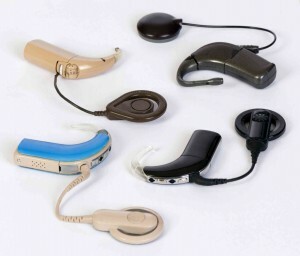 I don’t need a hearing aid – Many people sadly refuse to improve their hearing due to a false sense of pride, fearing that a hearing aid will be a burden. However, if you have hearing loss, a hearing aid can vastly improve your quality of life and your day to day communication. This entry was posted on Friday, October 28th, 2016 at 11:33 am. Both comments and pings are currently closed.